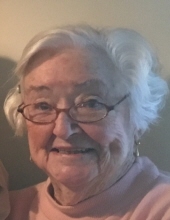 Leila Jean Ripard, 93, of Pawleys Island died March 23, 2019. Jean grew up in Georgetown and met her husband, who was in the Coast Guard during World War II. They raised their family of five in Michigan and later retired to Pawleys Island where they had a kayak business. She will be remembered for her humor and kindness, always with an open door and an extra plate at the table. She is survived by: five children, Ron Ripard (Pat), Connie Whitlock, Mary Mitchell (Hal), Gail Stouffer and Beth Corcoran (Gary); eleven grandchildren, Tony, Amy, Becky, Sarah, Rachel, Joseph, Jesse, Ben Seth, Jeanine and Julia; and eighteen great-grandchildren. Funeral Services will be held eleven o’clock Saturday morning, April 27, 2019 at Precious Blood of Christ Catholic Church. Burial will be at two o’clock at Elmwood Cemetery in Georgetown. The family suggests memorial to: Osteogenesis Imperfecta Foundation, P.O. Box 824061, Philadelphia, PA 19182-4061. To send flowers or a remembrance gift to the family of Leila Jean Ripard, please visit our Tribute Store. Guaranteed delivery before Leila's service begins. Guaranteed delivery before Leila's cemetery begins. "Email Address" would like to share the life celebration of Leila Jean Ripard. Click on the "link" to go to share a favorite memory or leave a condolence message for the family.